I did make a few other suggestions but I also like to experiment with wine and food – and not just with Thanksgiving. Actually, I’d suggest it’s great palate-expanding exercise for any regular wine drinker. How about a Soave or even Pinot Grigio with your red sauce pasta? And one of my favorite exercises is trying to get white fish lovers to try a 100 percent Mourvedre or a nice Languedoc red blend. Ying and yang are friends of mine and I’d encourage you to find your inner wine geek and break the molds. Drink what you like, experiment, and ignore the same ‘ol, same ‘ol. Now, that being said, I didn’t go crazy this Thanksgiving day but I did do something different. I love good Chenin Blanc. I had never done Chenin Blanc at Thanksgiving but the more I thought about it the more I thought it should be a perfect pairing. 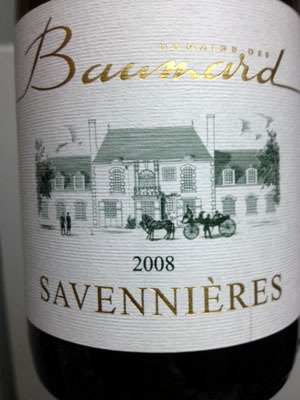 If you like bone dry and minerality in your whites, you’ve got to be sampling Loire Valley whites.This Domaine des Baumard 2008 Savennieres was simply outstanding. Indeed, bone dry was the first words that registered in my turkey stupor when tasting this wine. I got lemon, richness, and complexity that was a perfect partner for the bird. An interesting sidenote, I found this bottle in an unexpectedly large wine shop in Columbus, Indiana. It was marked at $24.50. If I had better internet access visiting Mom, I’d double check the price point across the net. But it’s taken a Herculean effort to get the photo uploaded, through Photoshop, and this blog posted. My guess is that’s a pretty fair price. If you like your whites bone dry the Baumard is outstanding. Now, I think I’ll finish the bottle off with a turkey leg!